Kenya National Bureau of Statistics hereby releases monthly Consumer Price Indices (CPI) and rates of inflation, for February, 2019. These numbers were generated from a survey of retail prices that targeted a basket of household consumption goods and services. The exercise was conducted during the second and third weeks of the month, with prices being obtained from selected retail outlets in 25 data collection zones in Nairobi and in 13 other urban centers. The Kenya National Bureau of Statistics (KNBS) has released the Gross County Product (GCP) report. This is the inaugural publication which covers estimates from 2013, when the counties started operating to 2017. Gross County Product is a measure of how much each county contributes to Kenya’s Gross Domestic Product (GDP) and may therefore be interpreted as the “County GDP”. The compilation of GCP is in accordance with international guidelines on estimation of regional gross domestic product. The compilation of report was done with assistance from the World Bank under the Kenya Accountable Devolution Program (KADP) – a multi-donor Trust Fund administered by the Bank and funded by DANIDA, DFID, the European Commission, Finland, Sweden and USAID. The GCP estimates are meant to address increased demand for economic statistics at county level. The report fills an important gap of official statistics on the economic size of counties, structures of county economies (sectoral contribution) and growth rates. The GCP estimates also show the economic potential of the various counties in different sectors. The report will help address common misconceptions on the size of counties and their contributions to the national GDP. 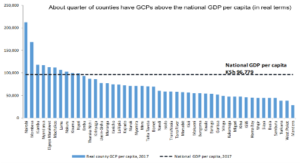 The analytics show that while some counties have a small contribution to the national GDP, they have greater potential for faster rate of growth and potential for catch-up with the dominant contributors. The enactment of the Constitution of Kenya 2010 led to county-oriented development planning that in turn resulted in increased demand for county-level data. Economic statistics to guide policy and planning at the county level are now needed for measures including Gross Domestic Product (GDP), economic growth, per capita income, sectoral growth and employment. It is in response to some of these needs that KNBS embarked on the compilation of estimates of Gross County Product in 2017. KNBS intends to be publishing the GCP estimates on an annual basis and has developed a framework for integrating GCP, growth rates and sectoral contribution in the system of national accounts. The Gross County Product (GCP) report was officially released by Mr. Henry Rotich, Cabinet Secretary, The National Treasury and Planning in the presence of Dr. Julius Muia, Principal Secretary, State Dept. for Planning, The National Treasury and Planning. Also present were senior officials from the Government, World Bank, other development partner’s agencies and the media. Population and Housing Census is conducted every ten years in line with the international standards. Kenya has conducted seven censuses in 1948, 1962, 1969, 1979, 1989, 1999, 2009. Kenya has conducted censuses after every ten years since 1969. 3. When will the next census be conducted? Kenya’s next census will be conducted in August 2019 from the night of 24th/25th to 31st August, 2019. 4. Who will be counted? All persons who will be found within Kenya’s boundaries on the night of 24th/25th August, 2019 will be counted regardless of whether they are visitors or not. 5. Who takes lead in implementation of Census in Kenya? Kenya National Bureau of Statistics, as part of its mandate, spearheads the undertaking of the Census on behalf of the government through, an Act of parliament and a gazetted legal notice. This is done in collaboration with different Ministries, Departments, Agencies, learning institutions private sector and development partners. 6. Who is Kenya National Bureau of Statistics? Kenya National Bureau of Statistics (KNBS) is the principal Government agency responsible for collection, compilation, analysis, publication and dissemination of official statistical information and is the custodian of official statistical information. 7. Why conduct a census? Census is the primary source of reliable and detailed data on the size, distribution and composition of the population in the country at a specified time. The information collected during census when analyzed gives an accurate picture of how many people are living in the country/county at every administrative level and their living conditions as well as access to basic services. This will inform planners on the social services people require such as education, healthcare, housing and transport. The data is also vital for monitoring internationally and locally agreed upon agenda such as Sustainable Development Goals (SDGs), Vision 2030, the Big Four Agenda etc. 8. What is new about 2019 Census? The 2019 Census will be administered using computer aided personal interviewing (CAPI) technique. A tablet will be used to capture the information directly for better accuracy and faster processing of the data. The Bureau has adhered to international guidelines which advocate for the values of professionalism, transparency, accountability and integrity required of statistical systems in maintaining credibility and public confidence. 9. Will Biometrics be taken during the 2019 Census? No. The 2019 Census will follow the UN Principles and Recommendations for population and housing censuses, which do not recommend use of biometrics to capture details of household members. 10. Who will answer questions in the census questionnaire? The questions in the questionnaire will be answered by the household head or any other responsible member of the household who can provide the required information about all those who spent the night of 24th/25th August in the household at the time of the interview. 11. Why do I have to participate in Census 2019? Census data is used for planning purposes. If you do not participate, the data collected will not be a true reflection of the Kenyan population. The Government as well as private sector needs accurate information for effective planning and policy formulation. 12. How do I know that the person at my door is from KNBS? 13. How will you make sure I am counted? The Kenya National Bureau of Statistics has been conducting cartographic mapping since 2016 where the whole country and existing homesteads and households in the villages are mapped. This will be used to create Enumeration Areas (EAs), each with its map for all villages in the entire country. Each enumerator will be assigned an EA with clear boundaries to guide him/her to ensure total coverage, with no omission or duplication. After your household has been visited a number will be written at a secure place in your household such as the top corner of the door to indicate that counting has taken place in the household. 14. Whom do I contact in case my household is not covered? In case your household will not have been contacted by 31 August, a toll free number will be provided for you to contact KNBS to send an enumerator to enumerate your household. 15. How will the information collected be treated? The information that you will provide to the census personnel will be treated with strict confidentiality in accordance with the Statistics Act, 2006. According to the Act, anybody working with KNBS who discloses personal details of a respondent is liable to prosecution. Everyone who will be expected to have access to respondents’ personal details during the census, will take an oath of secrecy to ensure that they protect the privacy/confidentiality of those who provided the information. 16. In which languages are the questionnaires available? The questionnaires will be in English and Kiswahili languages. The enumerators will also be able to speak in the local dialects since they will be recruited from the localities they reside in. 17. How long does it take to fill in the questionnaire? The time taken in a household will depend on the number of persons who will be present in the household on the census night. However, on average, it will take between 35-45 minutes to complete enumeration of a household. 18. What will show that a household has been enumerated? After enumeration, the officials will write a number on the door or any visible place on the structure to indicate that counting has been conducted in the household. PLEASE DO NOT ERASE THE NUMBER. 19. Do I need to show any documents to the enumerator? The enumerator will take down all particulars as given by you. In case you are not sure of some information (e.g. age) you may check your documents to confirm and provide accurate information. 20. Will I be enumerated if I am in a hotel or on transit on Census night? Yes, you will be enumerated irrespective of where you will be on the census night provided you are within the borders of Kenya. There are five different questionnaires that will be used during enumeration. One main questionnaire and four short ones. The main questionnaire will be used to enumerate persons in conventional households; the short questionnaires will be used to enumerate people who are on transit (e.g. at airports, bus stops, etc. ), those in institutions (e.g. schools, prisons, hotels etc. ), outdoor sleepers and emigrants. 21. If on the night of the 24th/25th August, I am out of the country, will I be counted? No. KNBS conducts a de facto census, which means that people will be counted depending on where they will be on the night of 24th/25th August. Anyone who was in the country before midnight of 24th/25th August will be counted; anyone who enters the country after the 24/25th August 2019 will not. However, a short questionnaire on emigrants will be used to collect information in households that have had emigrants in the last 15 years. Their information will be provided by the head of the household and responsible member of the household. 22. If I have visitors on the night of the 24th/25th August, should they be counted as part of my household? Anyone who will be present in your household on the night of 24th/25th August, 2019 will be counted together with your household. Everyone will be counted depending on where they will be on the night of 24th/25th August, 2019. Those who will be on duty working (e.g. a nurse) on that night will be counted with his/her household that he/she will return to the following day after work. 23. Will refugees be counted? Everybody who will be within the Kenyan boundaries on census night (night of 24th/25th August 2019) will be counted including refugees. 24. What questions will be asked? The census questionnaire that contains questions to be asked during the 2019 Census can be downloaded from www.knbs.or.ke. 25. Why is the ethnic background asked about? Data on ethnicity is collected for its statistical value, not because of the numbers but in the label/attribute. The information has enormous socio-cultural value that is useful in planning and research. Ethnicity influences lifestyle, which determines certain demographic, social and economic characteristics that drive socio-economic development. All previous censuses conducted in Kenya have collected data on ethnicity, reflecting a long-standing and continuing demand for information about ethno-cultural characteristics of the Kenyan population. Kenyans are encouraged to use the information positively and responsibly. 26. Why do you ask questions about the household assets I have in my house? The information collected gives the status of well-being for the household, and is used to generate economic and social indicators. 27. Will the general public access the results? The general public will be able to access the census results once they have been launched. The census results will also be available to the public through the KNBS website and publications (inform of preliminary results, basic reports, detailed reports (monographs), maps etc.). 28. Has KNBS advertised the census jobs for supervisors and enumerators? The job advertisements will only be done in the local national newspapers and the KNBS website (www.knbs.or.ke). The positions will be advertised from June 2019. For now no advertisement has been done and the public is advised not to fall prey to conmen who are out to swindle them of money. The Government does not ask for money from its citizens when they apply jobs. 29. What are the security arrangements in place? The county census committees will be in charge of security arrangements in the respective counties. This will involve in part use of local administration and recruitment of enumeration personnel from the areas they reside. Each security team is expected to take measures according to the unique security concerns in their areas. Should you have any further questions or comments about 2019 Census please contact us on Tel: 020 3317583/6/8, Hotline Numbers: 0701244533, 0735004401 or email us at [email protected] Visit our website: www.knbs.or.ke.